Discussions Magazine Music Blog: WILLIE NELSON AND MERLE HAGGARD: Together on DJANGO AND JIMMIE/Available June 2nd, 2015! WILLIE NELSON AND MERLE HAGGARD: Together on DJANGO AND JIMMIE/Available June 2nd, 2015! 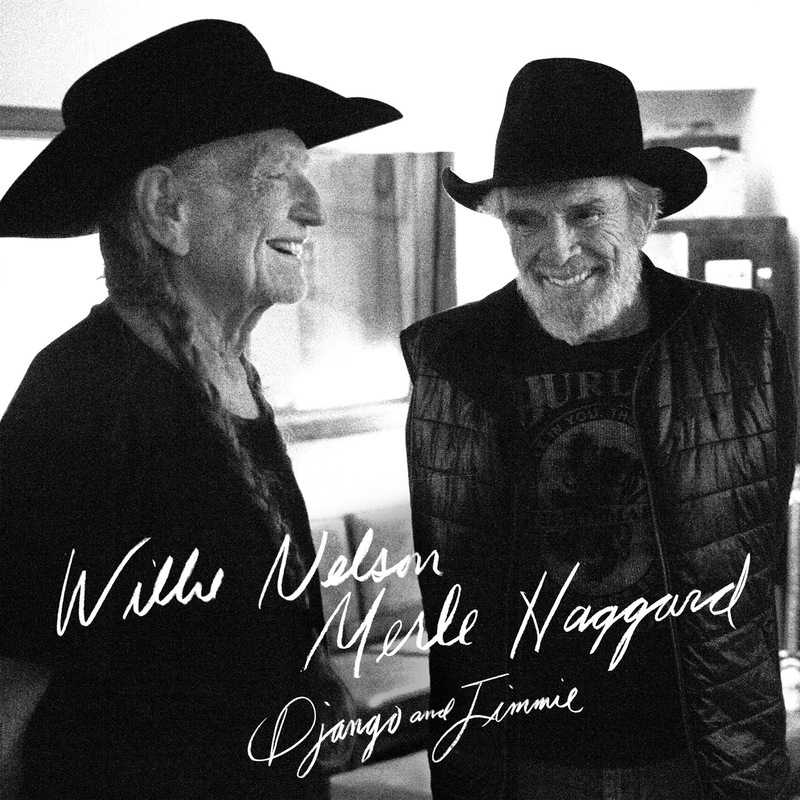 Legacy Recordings is proud to announce the June 2 release of Django and Jimmie, the new studio album collaboration from Willie Nelson and Merle Haggard, two of the founding fathers of American outlaw country music. "Me and Merle got a new album coming out called Django and Jimmie and the title track is about Django Reinhardt and Jimmie Rodgers," said Willie Nelson. "Both of those guys were very influential in both of our careers." According to Merle Haggard, there's "new songs, a couple of classics and Willie sang like he was a teenager." For Django and Jimmie, Willie Nelson's sixth studio album release for Legacy since inking an historic deal with the label in 2012, the legendary singer-songwriter joined forces with longtime friend and collaborator Merle Haggard to reignite the musical chemistry that made the pair's Pancho & Lefty a honky-tonk blockbuster and America's #1 Country Album following its release in January 1983. Driven by a title track penned by Townes Van Zandt (and arguably the songwriter's most familiar song), the critically-acclaimed top-selling Pancho & Lefty solidified the reputations of both Willie and Merle as among the most formidable and influential artists in outlaw country music while topping the Billboard Country charts for seven non-consecutive weeks between April and October 1983. The success of Pancho & Lefty opened the doors for a number of successful follow-up projects including 1987's Seashores Of Old Mexico album, 2007's double album Last Of The Breed with Ray Price, and the Merle Haggard-penned "A Horse Called Music" (the lead track on 2012's Heroes, Willie Nelson's first album for Legacy). Helmed by Nelson's longtime producer, collaborator and friend Buddy Cannon, Django and Jimmie premieres 14 brand-new studio recordings including: "Django and Jimmie," a dual tribute to jazz guitarist Django Reinhardt and Jimmie Rodgers, country music's mythic "Singing Brakeman"; the reflective and meditative "Live This Long"; "Missing Ol' Johnny Cash," an homage to country music's original Man in Black featuring guest vocals from Bobby Bare; a sublime interpretation of Bob Dylan's "Don't Think Twice, It's Alright"; and the future outlaw country classic "Unfair Weather Friend," written by rising songsmiths Marla Cannon-Goodman (Buddy Cannon's daughter) and Ward Davis. A legendary country music producer and songwriter in his own right, Buddy helped pen five of the album's tracks, including "It's All Going To Pot" (a rollicking anthem for the emerging 21st century cannabis culture) and four cowrites with Willie: "Alice In Hulaland," "It's Only Money," "Where Dreams Come To Die," and "Driving The Herd." Among the 14 essential recordings on Django and Jimmie, Nelson and Haggard each pay musical tribute to the other through heartfelt solo performances: Willie singing Merle's "Somewhere Between" and Merle covering Willie's "Family Bible." Willie sums up the duo's new collaboration simply saying, "It's good music, I got a good feeling about it."